Posted byMei 22 April, 2015 28 October, 2015 Leave a comment on Eczema ‘Cure’ Series – Do How We Bathe Matter? Personally, I alternate between an oatmeal-based bath, a chlorhexidine-based bath lotion and a hypoallergenic cleanser for my eczema child (Marcie, who’s 6 years old now!). I haven’t dared to try a bleach bath nor mixing vinegar though these two have also been recommended by dermatologists. 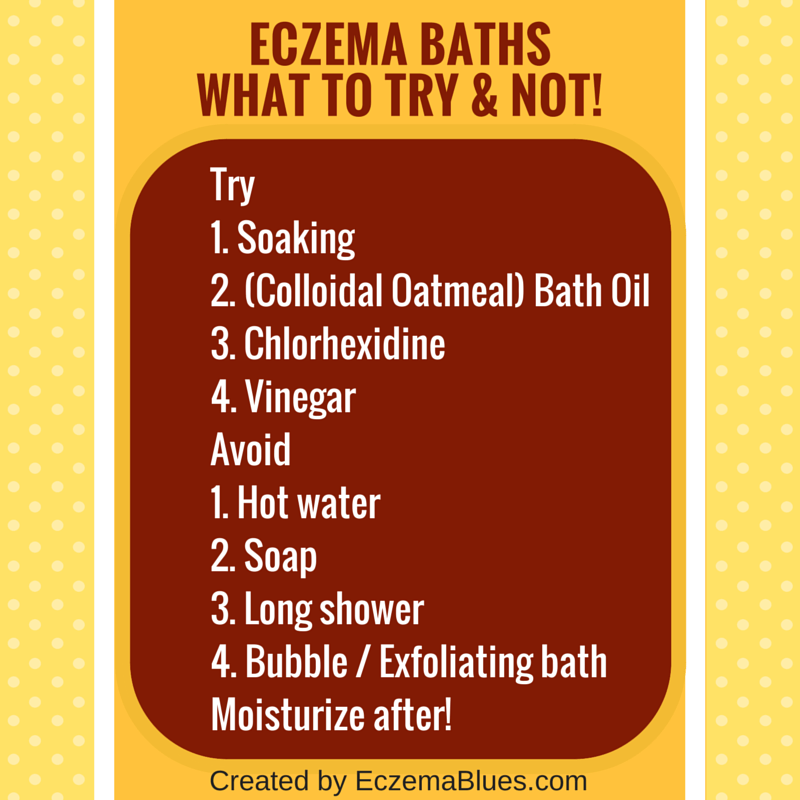 Let’s explore the various baths for eczema sufferers! If you have a bath tub or your child still fit into one, soaking in a bath tub (not hot water, but use lukewarm or room temperature) for not more than 10 minutes can help the skin to absorb water. Especially for those of you who have to endure dry, winter months, possibly dissolve a thick emollient into the bath as well! Note: Don’t soak your head in the tub! Bath oil – Try colloidal oatmeal bath or other bath oils but be sure they do not contain the key irritants such as fragrance. Oatmeal bath can relieve eczema itch. Bath oil tend to leave a film on the skin and possibly a quick rinse will suffice instead of trying to wash the ‘film’ away – I guess that’s a bit defeating the purpose of using a bath oil. Here’s a study on bath oil for infants. The main purpose of bleach bath is to kill the staph bacteria that often colonizes eczema skin. I’ve the privilege of interviewing dermatologist Dr Cheryl Lee who is an early proponent of bleach bath (more here). Bleach bath is to be limited to no more than 3 times a week. A study on bleach bath here and updated research news on bleach bath here. I used to wipe my child’s skin with chlorhexidine when I noticed persistent itch or redness. Since I’ve been prescribed a chlorhexidine-based shower lotion, I’d use it say once a week especially as my child has quite a few ‘high bacterial’ habits! More on chlorhexidine and bleach bath from my interview with dermatologist Dr Clay Cockerell. If bleach sounds too aggressive/ chemical/ toxic to you, consider vinegar. I’ve had an informative interview with Dr Cheryl Lee where she shared how vinegar balances the skin pH level on top of killing the staph bacteria. Vinegar bath may be stinging for some eczema skin/wounds, check with your doctor first. Some like to add magnesium flakes into bath, while others use salt. So many eczema sufferers SUFFER FROM ITCH and sometimes, uses hot water to numb the itch for a relief during shower. However, hot water strips moisture from skin, avoid at all costs. Soap is drying because it’s way too alkaline for our skin, more here on soap here. It often causes skin irritation too. Too long a shower strips moisture from skin – it’s a bit mind boggling when you first heard of it, shouldn’t the longer you shower be more moisturizing? It’s not – think of it as a thunderstorm washing off the cement in the brick wall. Most of the bubble bath solutions contain irritants, avoid bubble bath for children with eczema. Our skin exfoliates on its own – using scrubs can further break down the skin barrier which is already ‘weak’ for eczema sufferers. Pat dry (not rub dry), moisturize within 3 minutes after shower. More in this video. If bathing is so troublesome, why not forgo bathing? First of all, that’s downright unbearable, especially for us in hot weather cities (Singapore, Asia, Australia and parts of US too!). Secondly, bathing has a purpose to remove dirt, sweat and skin debris which can also be irritating if left to accumulate on the skin. Instead, you can try shortening the length of a shower or reducing the number of times you shower (in a day, not a week! – No way I can don’t shower everyday in Singapore!). Do share your bathing tips in the comments, we love to hear more of what you’re doing!